These Practical Arrangements are made between the International Atomic Energy Agency (hereinafter referred to as “the IAEA”) and the Hiroshima International Council for Health Care of the Radiation-exposed (hereinafter referred to as “the HICARE”), in the context of fostering cooperation in the field of medical management of radiation exposed individuals. In the context of increasing global interest in the peaceful uses of nuclear energy and related applications, and desirous to contribute to international peace and stability, the IAEA and the HICARE will endeavour to implement cooperation activities in the areas identified in Article 2 (1) below, including by jointly developing and/or conducting programmes in medical treatment of and research on persons affected by the exposure to ionizing radiation. (1) The IAEA and the HICARE have identified the areas of cooperation as listed below. Detailed programmes will be developed based on consultations between the IAEA and the HICARE, taking into account mutual benefits. ・ Hosting by the HICARE of relevant training programmes organized by the IAEA for individuals, including researchers, healthcare providers and other concerned persons in the field of medical management of radiation exposed individuals. ・ Provision by the HICARE of its experts as lecturers to relevant training programmes in the field of medical management of radiation exposed individuals organized by the IAEA such as the radiation emergency training programme. ・ Joint research in the field of medical management of radiation exposed individuals such as the effects of radiation exposure on humans. The results of such joint research may contribute towards developing and updating of relevant IAEA publications and training material related to preparedness for and response to a radiation emergency. ・ Organization of joint conferences, seminars and workshops with the aim of enhancing public awareness in the field of medical management of radiation exposed individuals. ・ Exchange of information and experience in medical treatment of persons affected by the exposure to ionizing radiation under the framework of the IAEA Response Assistance Network (RANET). (2) To strengthen the above areas of cooperation, the IAEA and the HICARE will benefit from the know-how and experience of existing affiliated organizations of the HICARE. (3) The IAEA and the HICARE will endeavour to disseminate and make available to the international community any relevant information gathered in the process or as a result of conducting the aforementioned cooperation activities, e.g. through public websites. (4) The IAEA and the HICARE will cooperate to ensure that the intellectual property and rights thereto, including, without limitation, all copyrights and patents, in and to any material or invention produced by either Party, their employees and sub-contractors arising from the cooperation between the Parties in the implementation of these Practical Arrangements can be used to further the IAEA and the HICARE statutory functions of, inter alia, fostering the exchange of information among IAEA Member States and HICARE affiliated organizations. 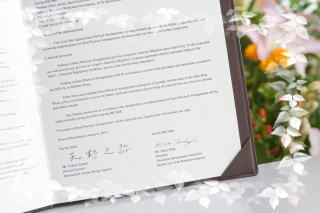 Two years after signing these Practical Arrangements, or when deemed appropriate, the IAEA and the HICARE will review the implementation of these Practical Arrangements and discuss the way forward for further cooperation. Nothing in these Practical Arrangements give rise to legal or financial obligation upon either Party. 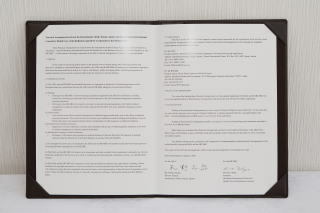 To the extent that any such activity may give rise to a legal or financial obligation, a separate agreement shall be concluded subject to the IAEA and HICARE’s Financial Regulations and Rules, prior to such activity being undertaken. Nothing in these Practical Arrangements shall be construed as a waiver of the privileges and immunities accorded to the IAEA by its Member States. Either Party may terminate these Practical Arrangements giving two (2) months written notice to the other Party. Where notice of termination is given, the Parties shall take immediate steps to bring all joint activities to a close in a prompt and orderly manner. Two copies of these Practical Arrangements will be made and each organization will maintain one copy.